It's been refreshing to finally catch some epic films I'd intended to see for a long time. 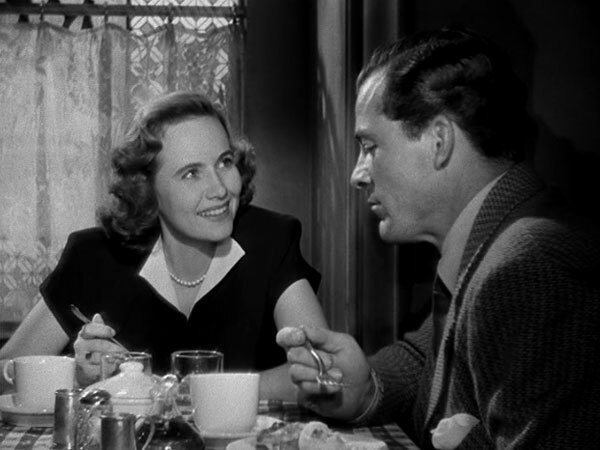 Flying under the radar was William Wyler's The Best Years of Our Lives, originally released in 1946. The Best Picture winner has received plenty of accolades, but I knew little about it until now. It's also ranked at #37 on the AFI 100 10th anniversary list. This is a classic that's well-known and loved by many critics and film experts. The 172-minute length makes it quite a time commitment, but all the acclaim made it an easy choice. Would my reaction match this exalted status? Al Stephenson (Frederic March), Fred Derry (Dana Andrews), and Homer Parrish (Haold Russelll) are heading home from World War II to the town of Boone City. They hang out on the plane and strike up a friendship before returning to their families. 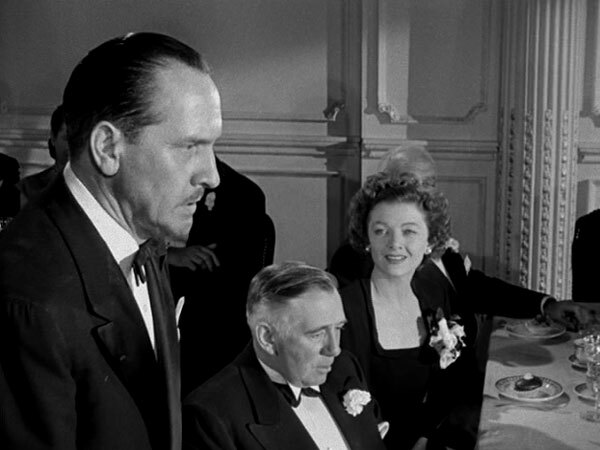 Al rejoins his loving wife Milly (Myrna Loy) and daughter Peggy (Teresa Wright), yet he isn't the same guy they knew. Fred was married right before he left for the Air Force, and his wife Marie (Virginia Mayo) isn't thrilled that he's back. The toughest return comes for Homer, who lost both hands and now uses hooks. The popular football quarterback was engaged to the striking Wilma (Cathy O'Donnell) but doesn't feel worthy of her love. These guys are facing different specific issues, but they're all struggling to fit back into society. Although The Best Years of Our Lives is long, I didn't avoid it because of the running time. Instead, I just wasn't that familiar with the story. Even when I sat down to watch it, the plot didn't sound very interesting. I was expecting a slow-moving and creaky older film, which is quite different than the actual result. The time moves quickly because we're engaged with the characters and want them to succeed. These guys haven't been turned evil by the war and commit only minor infractions. They're just unsure of how to return to a day job among the oblivious people who don't understand their experiences. I'm surprised to report that this story could take place across a variety of time periods. Even Roman soldiers in ancient times probably had a tough adjustment to the civilized world. What's interesting is how the setting is firmly planted in the '40s but escapes the confines of a period piece. Fred's difficulties relating to his money-obsessed wife are heart-breaking, especially when he pines for Peggy. After spending a fun night on the town, it's clear that they match together. There's a great moment when Marie thinks she has the upper hand and is ready to file for divorce. His glee at being free of this loveless marriage is an excellent moment and shows just how well it still works. I was pulling for Fred and Peggy from the start, and their story is just one of several excellent relationships. Definitely. This is a character piece with mostly low-key scenes, but they work. When Al stands up to speak in front of a table of businessmen, we cringe at what he may say and feel for Milly. She counts his growing number of drinks while trying to maintain the facade of the happy wife. 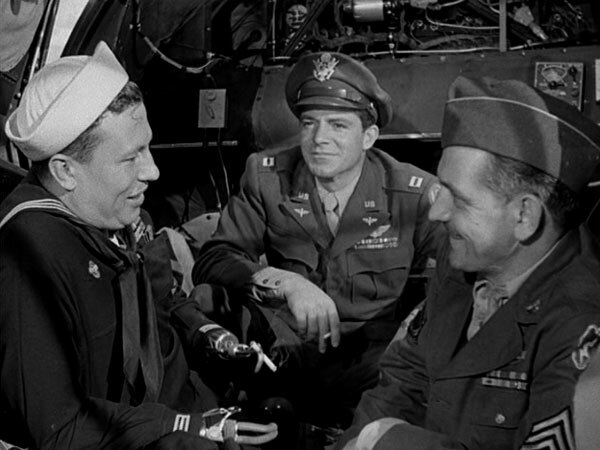 Frederic March and Harold Russell both won Oscars for their roles, and Dana Andrews is right up there with them. Russell's story is intriguing because his real life mirrors Homer's situation. There's no trickery to fake his injuries, which actually happened to him after a training accident. The non-actor makes Homer believable since he certainly experienced similar feelings after the injury. 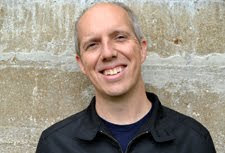 Robert E. Sherwood (Rebecca) also won for Best Screenplay, and his work is the key to the film's success. There are far too many great moments to describe, so I'll cover two of the best scenes. The first shows Fred strolling among neglected aircraft and reveals just how much he can't shake his experiences. When he climbs into the plane, it's clear that he's reliving horrifying past events. Shot at Ontario Army Field in California, this remarkable sequence tells us all we need to know about Fred. Taking one last visit aboard the bomber allows him to finally get over his distress, though I expect it isn't gone forever. Another classic scene involves Homer's attempts to convince Wilma that she should dump him. He takes her upstairs and removes the hooks to show how much help he needs each day. Russell is at his best in this conversation, and we forget he's a non-actor. 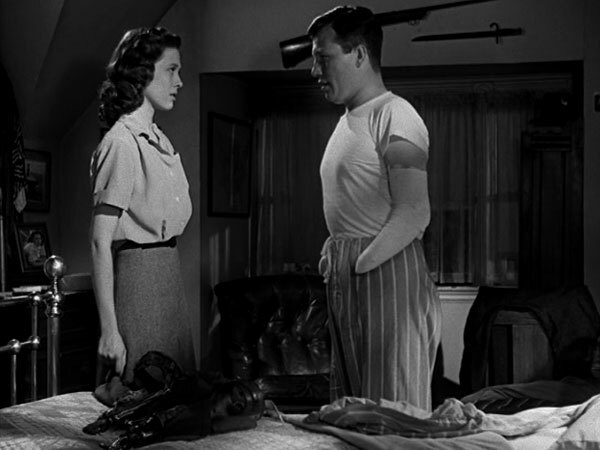 Wilma's ability to look at this damaged man and love him is charming, and their relationship never strikes a false note. I've watched some amazing movies in this series, and The Best Years of Our Lives stands right among the top choices. That's saying quite a lot when you consider that the field includes incredible movies like Once Upon a Time in the West and In the Mood for Love. While it doesn't match up to those films, this selection isn't too far away. William Wyler's (Ben-Hur) direction is straightforward and doesn't include the creative flourishes you might expect from a classic. His approach works for this material because it allows to get to know the characters. There are no distractions or cheap tricks to push aside the drama. It's the right way to tackle possibly heavy material that never feels overbearing. This relaxed approach strikes the proper balance and shows why many consider it such a great movie. One of my favorite post-war movies. So much in it makes me cry every time. Dave, it's sad to see how out of touch the society is in this story to what these guys went through. I didn't expect to be taken in by these guys' stories, so it was a nice surprise. Dana Andrews should have won. Wyler would have been pleased. The film would not have been the same without him. Definitely. The performances were award-worthy across the board; no arguments at all about Andrews.